WOJR: Organization for Architecture is an innovative group of designers based in Cambridge, Massachusetts, who are committed to the idea of architecture as a form of cultural production, engaging the intersections of art, architecture, and urbanism. 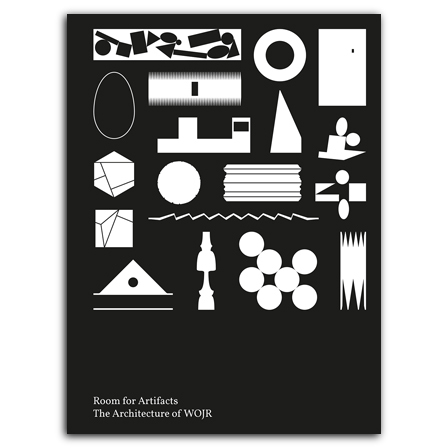 With this idea at its foundation, Room for Artifacts contains a collection of sixteen architectural artifacts designed by WOJR—a mask, a church, a labyrinth, a dwelling, a bust, and a series of totems, among others. The artifacts are presented three times throughout the book—in conceptual drawings, architectural drawings, and images. Certain characteristics recur, such as symmetry, frontality, figurality, proportionality, and the play between flatness and depth, underscoring WOJR’s preoccupation with the fundamental aspects of architectural form that are rich in historical precedent. Room for Artifacts offers a new way to explore the role of architectural representation in a contemporary context, looking at how architects can invoke aspects of ideologies from architects of the past while establishing a progressive agenda for a forward-looking body of work. , born 1978, is principal of WOJR and cofounder of the collaborative practice Collective–LOK. He is associate professor at the MIT School of Architecture and Planning.